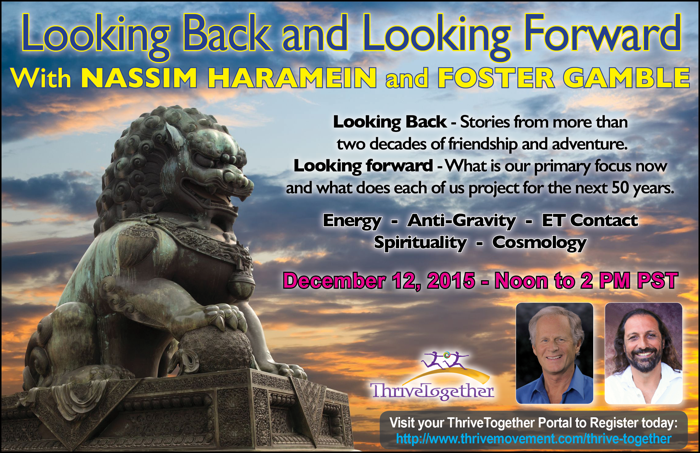 Join us in the ThriveTogether think tank for an intimate conversation with two cutting edge pioneers who have been dear friends and colleagues since the late 90s. Nassim and Foster will share useful and hilarious stories of their early struggles in shifting the paradigms of science and philosophy, their first secret energy lab and the early brainstorm sessions that led to their game-changing films BLACK WHOLE and THRIVE. They will provide updates on the current state of each of their research and developments with the Resonance Academy and ThriveConnect. We invite your own questions and insights as Haramein and Gamble offer their visions of the challenges and breakthroughs in store for humanity over the next 50 years. the transcendence of partisan politics and the New World Order through alignment with natural principles and the fundamental pattern? (from Sperry Andrews) Are you aware of the work of physicist James Beichler? If not please see: 21 December 2015 WISE Journal, Vol.4, No.4 1 Finishing Einstein Point by Point: The unification of quantum and relativity James E. Beichler, Ph.D.